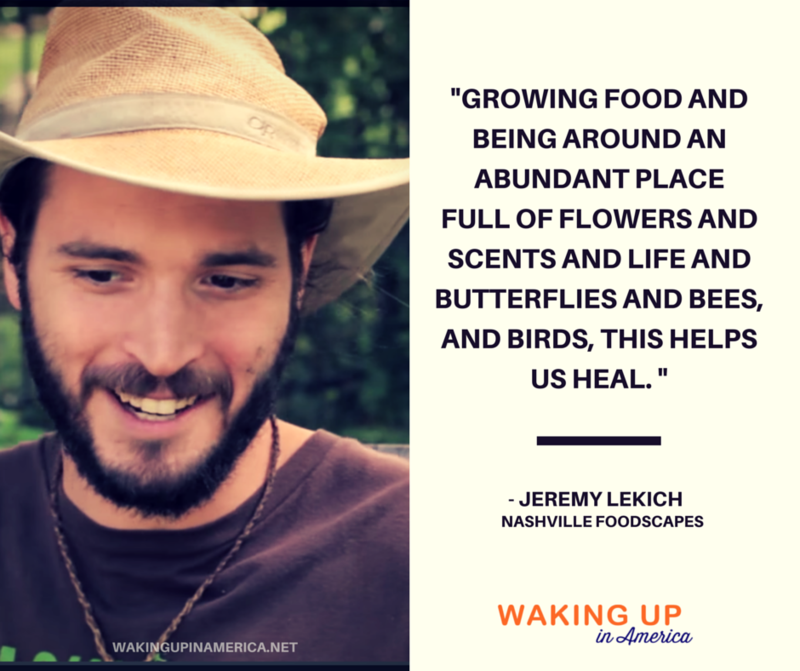 Jeremy Lekich is a landscape and foodscape designer and the owner of Nashville Foodscapes. He turns lawns into bountiful living spaces that please both the eyes and the taste buds, helping people connect with their food sources. He also has a band - Turnip the Beat. 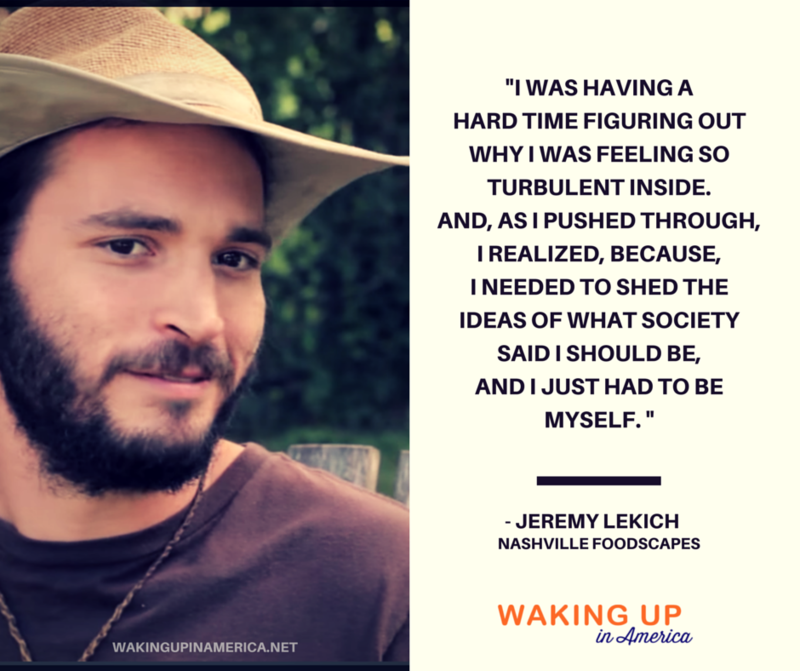 Jeremy Lekich is a landscape and foodscape designer and the owner of Nashville Foodscapes. He turns lawns into bountiful living spaces that please both the eyes and the taste buds, helping people connect with their food sources. He also has a band – Turnip the Beat. 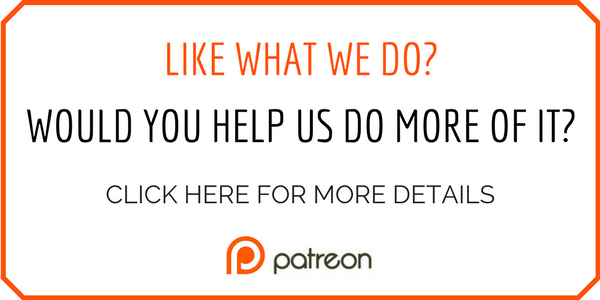 Read full blog on HuffingtonPost. “Take a break from your screens and come help me move some dirt,” I say to my three boys. They oblige without fuss, each according to their age and personality. My 9-year-old excitedly runs outside, asking for a shovel; my 12-year-old offers suggestions on how to tackle this task in the most efficient way, and my teenager shows up with his headphones on, intending to help do the work but not wanting to interrupt his audio book. My husband isn’t in town when the dirt is delivered, but he built the frames and tilled the soil before he left so all we have to do is fill it. “Not a problem” I say, feeling very earthy and strong. I’ve planted herb gardens before — mostly rosemary and lavender in nice pots — and what I had imagined “moving dirt” would look like was something you’d see in a Real Simple magazine. You know, with the blue wheelbarrow, red watering can and me wearing lime green gloves, a pretty hat, a flowery dress and a big healthy smile. But then Jeremy pulls up with a trailer of dirt. It’s a BIG pile of dirt. It has a strong odor, and it’s full of bugs. He hands out shovels to my boys, who in turn look at me and ask if I plan on paying them for this “extra” chore. “I’m giving you a chance to reconnect with your food,” I reply, and get to my job of pushing the wheelbarrow between the trailer and the backyard. Without gloves, a hat or flowery dress. The healthy smile, however, forms itself on my face during that first load. Throughout the whole process of building, planting and tending my garden, I notice how it stays there and spreads joy all over me, like the vines of my yellow squash and cucumber plants. As a “city girl,” I’ve always loved farmers’ markets, fresh food, and the fragrance of my potted plants. Growing food was something I never thought I’d attempt. But then we moved to Franklin, TN. Perhaps it was the weather, or my neighbors, but I suddenly felt the desire to grow food. Plus, my mom is visiting for the summer and I feel like my boys need an extended chance to play in the dirt and spend some time with her. I asked around for help with setting up some raised beds and was connected with Jeremy Lekich. 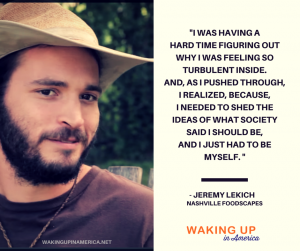 During our first phone conversation, he was eager to share with me the motivation behind his work, so I asked him to be my guest on Waking Up in America. I step out of my car wearing heels and a little black dress, sipping my Saturday morning latte when Jeremy arrives in his work truck. “Should I change?” he asks, looking at me. “No, you look great!” I say, secretly wishing I could look as cool as he did in a straw hat and a brown T-shirt. There was nothing “wrong” with Jeremy. He was a regular kid with good grades. But when he talks about the video games, I feel a little panicky. This is what my sons will say in a few years, I think to myself. He chose to go to a working college in the forested hills of West Virginia because he felt he had been cooped up in classrooms for too long. He loved nature and he was happy working on the landscaping team. But then, he noticed just how unhappy he actually was — even though he was pursuing what he thought would be his career as a bio-chemical engineer. Switching his majors and choosing a different career was a turbulent journey for Jeremy, but he sought the help of campus therapists and talked it through until he had the clarity to make the most important choice of his life: to follow his own path. Being himself, Jeremy comes alive. He radiates with joy when he talks about plants, birds, trees and playing music. 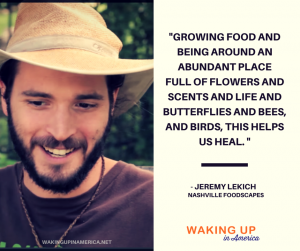 He has been helping clients to grow abundant gardens, to reconnect with their food sources, with nature and ultimately with their own purpose. We talk about the healing that this process of re-connecting can bring, and he tells me about the therapeutic garden he helped set up at the Fort Campbell Military Base. Jeremy helps me to buy good dirt and quality plants (or seeds) and tells me to have confidence because nature is set to thrive, not fail. It makes sense. Life is like that. When we trust, life expands. When we try to force it to behave our way, it is bound to fall apart. “Wow! I can’t believe we grew this in our garden!” my 12-year-old exclaims when I harvest our first zucchini. “It even looks better than the ones we buy at the store,” my youngest chimes in. The oldest smiles at me, understanding the simple and yet most elemental joy that comes from reconnecting with our food, with nature, and ultimately with the Source of all life. I send out a ripple of gratitude to Jeremy, who has helped my family to wake up and smell the zucchini.